There are a lot of amazing promotional items available to organizations, nowadays—but how many will truly capture your customers’ attention? Pamphlets and cheap toys often end up in the trash, and business cards and stickers are easily misplaced. 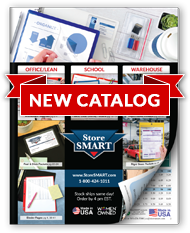 If you want to put your organization’s information right at eye level—and keep it there—invest in StoreSMART’s Custom Printed Picture Frame Magnets. Each magnet offers you two opportunities to promote your business or service organization, including the center punch-out portion and the magnetized photo frame. Your customers will appreciate the functionality of our study, powerful magnets, and the fact that they’ll actually opt to use them means they’ll have constant access to your information. Whether they choose to slap your message on their kitchen fridge or an office filing cabinet, it’s sure to remain visible and active—and thus provide a solid return on investment. Each magnet measures 3 ½” x 5 5/8” and 0.019” thick. Center punch-out measures 3” x 3 ¼”. Provide your own graphics, or let us print a calendar for you! When ordering calendars, specify starting month and year. Meant for indoor use only. Great for businesses, schools, family events, and service organizations. Create lasting keepsakes and handouts.